Musca vetustissima — commonly known as the Australian bush fly — is a species of fly found in Australia. It is the specific fly that has given rise to the expression “Aussie salute”. This species of Dichaetomyia has reddish brown body and red eyes. The body is stocky with strong bristles. These flies are related to the common house fly. The bush fly is a dung fly that is closely related to the bazaar fly. The adults are attracted to large mammals for fluid for nourishment and feces for oviposition. A study showed that there is a low survival rate for eggs and larvae in cattle feces because of infrequent rainfall. The study also showed that parasites and predators have caused a low survival rate. According to a study, the fly can spread harmful bacteria. The fly can spread the pathogens Salmonella and Shigella. Most of the bacterial populations per fly occurred in a farm environment, while an urban environment was the lowest. A standard composition that contains small amounts of trimethylamine and indole, blended with large amounts of ammonium sulfate and anchovy meal, attracts the fly. A wind-oriented trap has been used to catch this species. The number of ovarioles in females probably have to do with how big they are. If females do not obtain enough dietary protein, the maturation of their eggs will stop. The fly likes to crawl on human faces as well as on the faces of livestock. 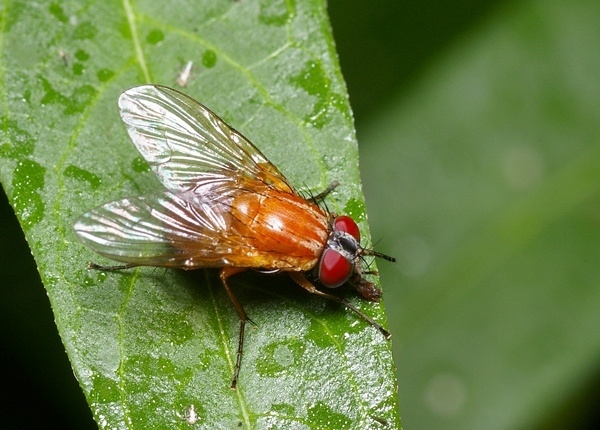 Bush Flies lay their eggs in animal dung where the maggots hatch and develop.